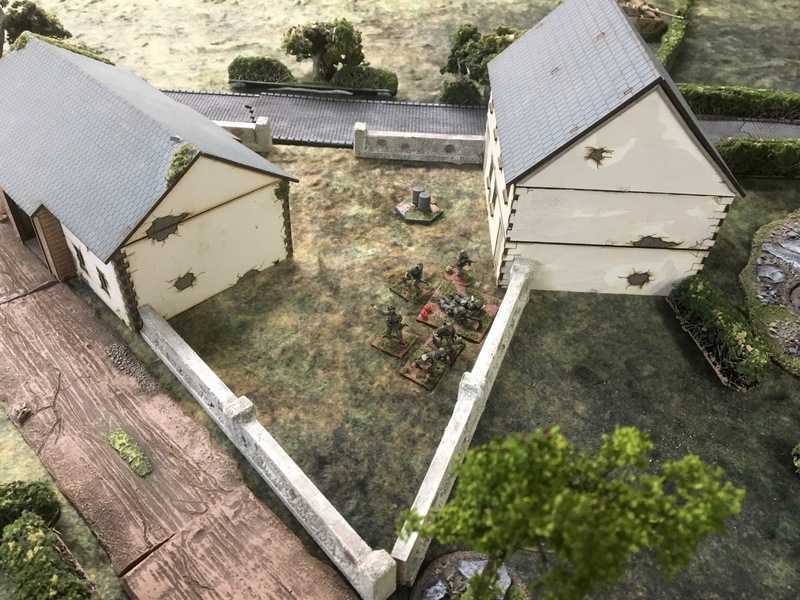 wargaming in 28 mm and sometimes smaller: Martlet: Pushed Through! 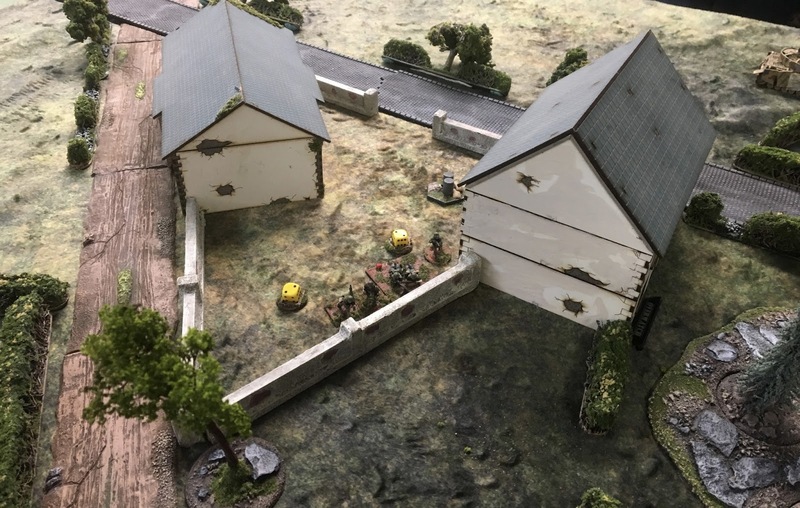 We had our 5th game in our CoC Martlet campaign today at the Hobby Bunker in Malden, MA. My back was really against the wall now in this campaign, I had already lost 16 men and have had to use my reinforcements in the 2nd turn. Additionally the Germans were intact without loss, and their morale was high. I was getting killed on the Force Morale every game. It was time to really have a plan. We were playing Table 2 a second time, the terrain is as laid out below and is scenario 3 in the main rulebook. I diced for my free moves and threw a 6, which was excellent. 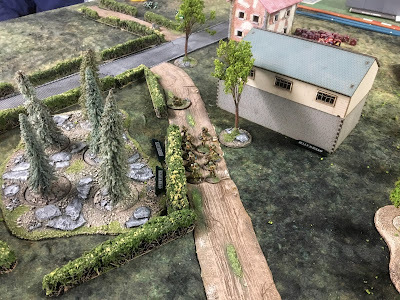 I ended up pretty well where I wanted with my JOP's and had held the German patrols to no more then 1/2 way up the terrain. The game played out as follows. 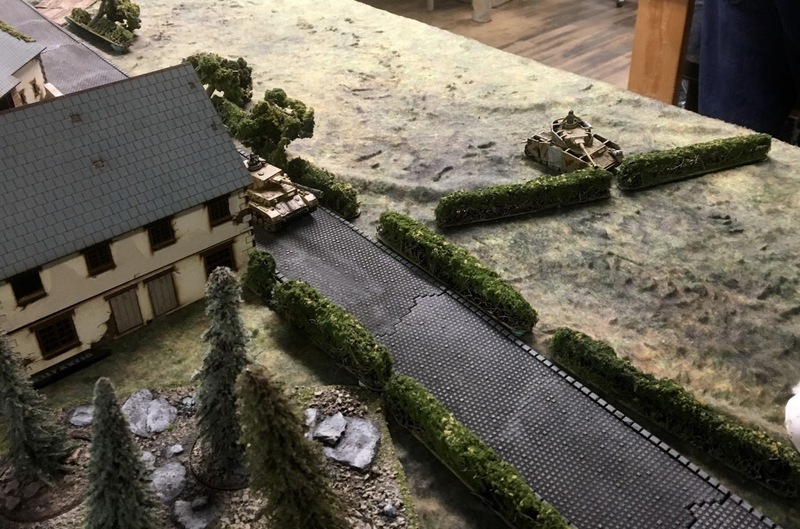 In the first few phases, I decided to get the troops on the table quickly. I had pretty good JOP positions so could cover the ground well. I did not want to expose myself but had to be in position to lay down some fire when the Germans did appear. One squad in the house and one squad in the orchard. I decided also to place a HMG in the house with one of the SL's. With 3 units in the house shock can be easily spread out. I also put a 2" mortar on the edge of the orchard. 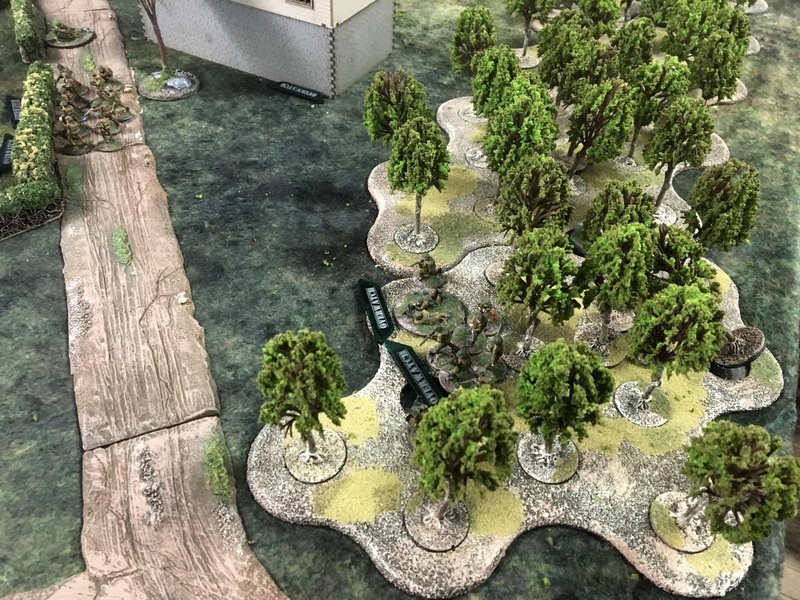 Mike cautiously put one PG squad in the forest well out of my LOS, and brought on a Panzer IV on the road. Once he committed himself to an advance, I placed my Piat team in good LOS. I started to lay down smoke and to assist with this I brought on my second Mortar team. Once enough smoke was laid I advanced one of the mortars to my right flank to cover the asphalt road. Mike responded by reversing the Panzer IV and changed his line of advance. He then deployed a 2nd Panzer IV ( I had really hoped that he had not taken a 2nd Panzer as a support and had chosen a the 2" mortar as a 2nd support rather then a 2nd Piat team.......guessed wrong). 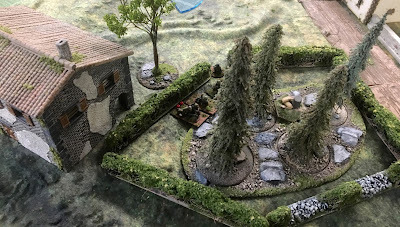 Under cover of smoke I ran the Piat team down the road and got them in the stone farmhouse. Mike then brought a 2nd squad into the house next to his central JOP. 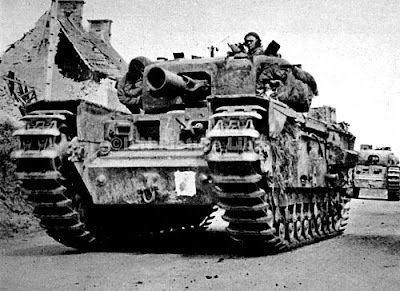 OK this was what I was hoping for so I deployed the Churchill AVRE to my left flank, out of LOS of the Panzers. The game was now afoot. I needed more targets and as bait, I deployed my 3rd section into the road and jumped over the hedge, Mike deployed his 3rd squad behind the wall. Now finally there were lots of targets with my men in fairly good position. 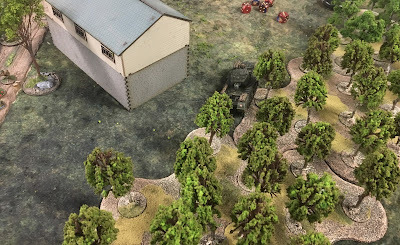 Mike ended the turn with a CoC dice but I was able to interrupt with my CoC of command dice and move the section which I had used as bait out of LOS of the PG squad in the garden. 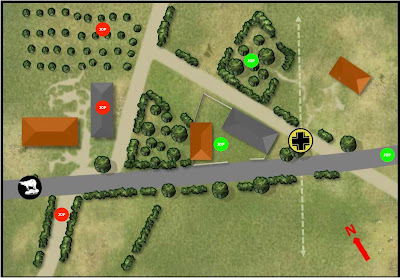 I advanced the AVRE and got 3 shots off at the forward Panzer, I needed an 8 to hit. I threw a 7 three times! Out of Ammo. Mike was able to fire back at the house with the CoAx MMG and the main gun of the Panzer. Some shock and one kill, all manageable. Back in forth fire but I was able to take out 4 panzergrenadiers in the garden with my HMG and Rifle section. They were pinned. I advanced the Churchill. Next phase I was ready with 16d6 of HE to bring down on the house that the other PG squad was holed up. Mike decided to cut his losses and withdrew. Table 2 was taken, a British victory. Some photos of the action. I was happy to secure a victory, the campaign is going to still me a tough slog, but there is now some hope and we move on to a different scenario. Nice one. I look forward to the next game report. Very nice, and congrats on the much needed win! Love the maps and your layout, awesome stuff mate!! Beautiful tabletop and great save when your back was against the wall. Now I want to get in some CoC. Awesome game table. I only can dream for one like your. Question how did you make your AAR maps? What graphic program are you using. Been follow your blog since 2009. Excellent Blog. I look forward to the next game report.